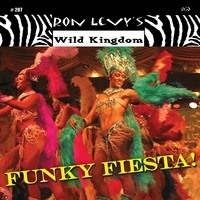 2012 - Levy's newest album "Funky Fiesta!" featuring his latest compositions with superb backing and personnel. Killer keyboards galore. Soulful & fun! Dedicated to the loving memory of two awesome and very dear friends & collaborators in music and in life; ‘Papa’ Willie Mitchell and Melvin Sparks Hassan. Miss you both madly & sadly. May their souls rest in heaven. Also, love to the Turbinton brothers of New Orleans, RIP. Pinetop Perkins too! I dearly miss my friends & teachers. Ron Levy is a passionate individual so it's not a real surprise that his latest endeavor is both soulful and introspective. This all-instrumental CD has many sounds: R&B ("Rebbe of Rhythm"), Soul ("Bad Mannish Boy"), Funk ("Phunky Memories"), Jazz ("Street Beats"), Jazz/Blues Fusion ("Someday"), Calypso cadences ("Back in the Back"); it's all there. Same salad; different dressings. The main focus is on keyboards and horns with very clever instrument arrangements and note selection resulting in a powerfully complex and ambitious sound. The all-star horn section includes: Sax Gordon, Scott Shetler, Mark Early, Doug Woolverton and Lil' Joe from Chicago. Long time associate Jeff Lockhart shines on lead guitar on his selected cuts. Songs like "Hittin it Hahd & Sweet", "Someday" and "Saxy Girl" could be soundtracks for movies in the "Shaft" vein and this groove-oriented CD has many layers in the tracks that make every song interesting and really enjoyable. Funky Fiesta is the real deal and again proves that Ron Levy is one of the most talented keyboardists in the world. Check it out. Ron Levy is a madman. In a good creative kind of way. But a madman none the less. Levy’s compositions on his new CD, 'Funky Fiesta', feature numerous musical styles and instruments crisscrossing and or supporting each other in way that are not usually done. Each composition is like a journey through Levy’s mind, and it’s a colorful and beautifully chaotic landscape. Like the best jazz albums, this Levy disc reveals something new with each listen because the composer has packed it full of aural nuggets. He uses mostly electronic percussion and programmed drumming for this outing. In fact, in his credits Levy lists the drummer’s name as 'Adrome MacHine'. Aside from Levy’s usually tasteful organ swirls, opening track “Bunga Bunga Akimbo” has got a sprinkling of piano over a hopped up, heavy funky bass line that still manages to sound organic even though it’s been layered for this song. “Sax” Gordon Beadle blows out a thick tenor saxophone melody that really spices up this keyboard jaunt. Levy seems to be following a play it by ear recipe here. He just throws in whatever sounds good. An organ chord strikes. A piano goes barrelhouse. Percussion dazzles. It’s all part of the kaleidoscope of sound that keeps changing, modifying itself in Levy’s ever flexible aural imagination. “Rebbe Of Rhythm” finds Levy laying out another fine set of organ notes. What goes on around him is even more colorful. Trash can lid percussion provides a warm colorful sound and some other sounds, synthesized, remind of Prince. It’s the thick crunchy layering of instruments that makes this tune an alluring piece of chunky funky. Levy slows things down a bit on “Back In The Back” to give his resonating vibraphone notes a work out. Adding a feeling of mystery is the take your time organ chords. Then, suddenly, without warning, it turns into an Afro-pop percussion frenzy before sliding into a grooving, moody saxophone glide. Told ya, Levy is mad. Simply mad. But at least he keeps things interesting. “Badd Mannish Boyz,” as the ghettoized Muddy Waters song title implies, combines hints of blues idioms with hints of modern urban music. Levy plays a smoking blues organ line that is aggressively punctuated by heavy duty bass and electronic percussion. He also midis his keyboard to make it sound like a futuristic musical instrument with a metallic timbre. Even the electric guitar here has been adjusted to sound like something you need a time machine to visit in the future. However, just when you think Levy has you settled into this modern funktified rhythm thang, his saxophone boy darts in with organic melodic offerings. Told ya, this Levy cat is crazy. “Street Beats” is an interesting concoction. Amidst an old school saxophone, percussion, and organ comes an occasional, measured horn sound that could’ve been lifted off a 1960s movie soundtrack. Its pop injection conjures images of an odd character motioning oddly around a movie scene. It also gives this piece a split personality in its timbres that works. The song is definitely cool. There’s an irresistible chemistry and symmetry between keys, sax, percussion, and numerous other things going on. “Saxy Girl” uses a fresh take on keyboards. Tinsel piano notes and metallic organ chords layer this heavy synth bass-driven, saxophone-lead take on modern funk. Levy finely balances traditional keyboards and drums with synthesizers and drum programming. These extra layers open up the sound fully and allow Levy to compose and record something much more colorful, interesting, and fresh. And mad. “Hittin’ It Hahd & Sweet” finds Levy delving more deeply into urban bass and drum sounds while spicing up the melody the old fashioned way, with clavinet and vibraphone. Jeff “Lockhart Monster” Lockhart peels off funky melodic phrases from his guitar that he has registered up high in the scale with an effects pedal, appealing as the lead guitar has an other worldly freshness. “Phunky Memories” is kicking keyboards galore. Punchy organ work grinds out a solid center while there are other keyboard melodies wafting around. Synth-bass and electronic percussion speed things up here and because they have such a wide timbre, they open up the space above for Levy to romp around. He’s like an artist with a huge canvas, filling it in with many colors. Listening to this on headphones turned up loud can blow your mind. There’s many flavorful sounds flying around and each one can remind of a certain stage in funk music history. The sounds will also get you high on their aural kaleidoscope dynamics and changes. Levy rocks the keyboards on “Sunny Sunday.” He’s got a wiry vibraphone melody sweetening things up while a synth-bass drops dollops of funky, knobby low end dexterity. The drumming is so tight that it forces Levy to keep all of his glorious keyboard sounds measured, distinct, and clean. There is an obsessive-compulsive control to all of the melody instruments here. These instruments only squeeze off so many brief notes and chords at a time. This allows them to dance around each other with mutual respect and discipline. The synth bass tells its own story of glory with bulbous low end notes that are durable enough to drive an 18 wheeler over. Title track “Funky Fiesta” is the loosest goose on this album. Its organ notes race over the song’s already speedy measures. Each keyboard note and chords is a shiny, pretty thing that the mad maestro has moving around with more energy than Mexican jumping beans. A jazzy, sprightly saxophone line zigs and zags its way with an unstoppable forward momentum. Doug Woolverton’s trumpet chimes in with a suppressed energy that makes it nervous and angsty like a person who can’t wait to get something off his chest. “Funky Fiesta” sounds like its title implies. Blazing horn section, quick runs of organ, and racing percussion burn big and bright as a bonfire. Levy closes out his album with “Someday,” a thoughtful piece that carries its pleasant thick sound along like a cloud on a breeze. Multiple keyboards are fully inspired and inspire the listener with their interwoven majesty, a work of art that requires busy thought, busy playing, and a touch of madness. The composer also has a way of emphasis. There’s a simple finger snapping sound placed just right to give it the importance of punctuating all that Levy has going on in his mellifluous, multi-melodic work. Funky Fiesta is one of Levy’s best albums and certainly his most interesting. It is a fetching work of art, beauty, genius, and artistic madness. A music composer simply has to have a unique way of hearing music and a unique way of imagining of how numerous sounds, some seemingly incompatible, would work once stacked up against each other. Levy certainly has that beautiful creative madness. Let’s just hope he doesn’t cut off his own ear or turn up dead in a Baltimore alleyway.